Designed to complement the story One Duck Stuck, this exciting 296 page activity pack is packed full of crafts and activities to support children’s learning in a variety of ways. 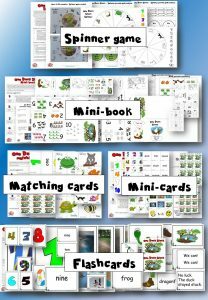 Use with or without the story to support learning about people, animals, colours and numbers, whilst also building on literacy and vocabulary skills. While the activities are primarily designed to facilitate English language acquisition, they are also valuable materials to develop fine-motor skills, social skills and understanding of the world. 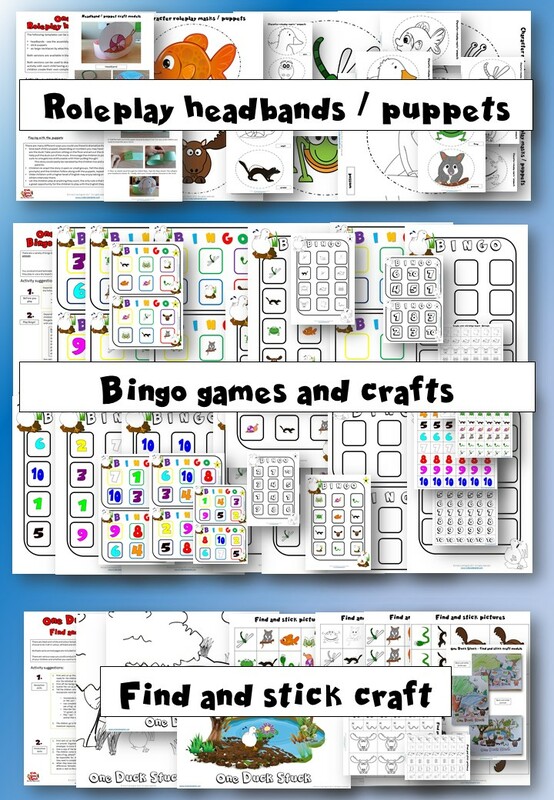 Colouring Sheets – Choose from a variety of sheets depending on ability and learning focus. Use the activity suggestions for extended learning ideas, focusing on colour, animal or word recognition. 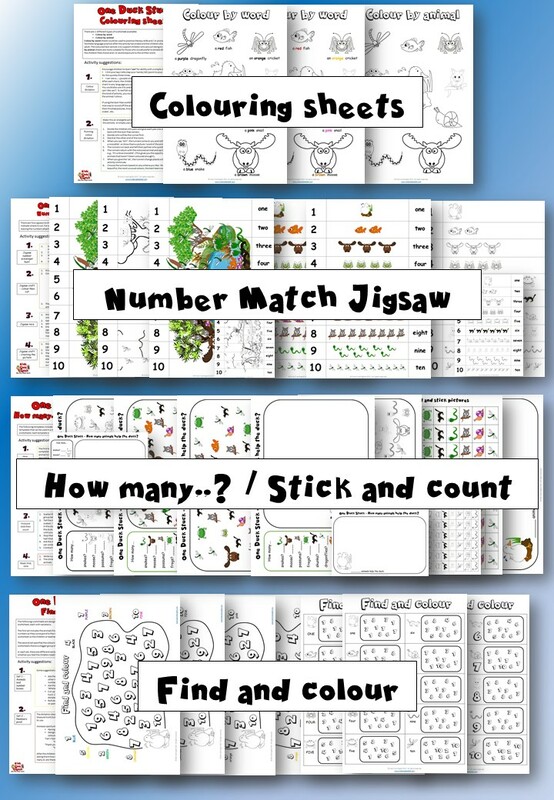 Number Match Jigsaw – Choose from a variety of jigsaw templates depending on the level of difficulty required. Follow the activity suggestions to create more learning fun with a scavenger hunt, jigsaw race or jigsaw craft. Find and Colour – Choose from 7 different worksheets focusing on number, and colour recognition. These worksheets vary in terms of difficulty, literacy skills, upper or lower case. See the activity suggestions for a variety of ways to conduct this activity in a more interactive way. How many? 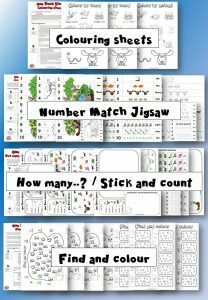 Stick and Count – Choose to simply print and use as a simple colour, counting worksheet or print the other templates for children to create their own worksheets. Children build on their numeracy skills and animal vocabulary. Roleplay headbands / puppets – Use the wide selection of templates provided to help children create masks or puppets of the characters and animals from the story which can then be used to re-tell the story, allowing the children to take on the character roles. Find and Stick Craft – Children can use the templates to create their very own One Duck Stuck scene or use the activity suggestions provided to play fun games that will support animal recognition and promote vocabulary skills. 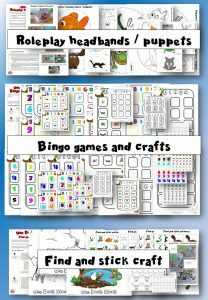 Bingo Games and Craft – Choose from multiple sets of smaller or bigger boards focusing on either numbers or animals OR use the blank boards and images to integrate more practice by having children make their own boards. Spinner Game – Have children help follow instructions to assemble this fun spinner game. Follow the suggestions to tailor the game to the age and ability of the children playing to learn about animals, numbers, sounds and actions, practise writing, creating sentences and further vocabulary skills. A dynamic craft that will help children recall the story and related language. Mini-book – Using the templates, follow the instructions to make your very own One Duck Stuck Mini Book. Children can play the games suggested whilst practising their folding, cutting and sticking skills then use their finished book to retell the story. 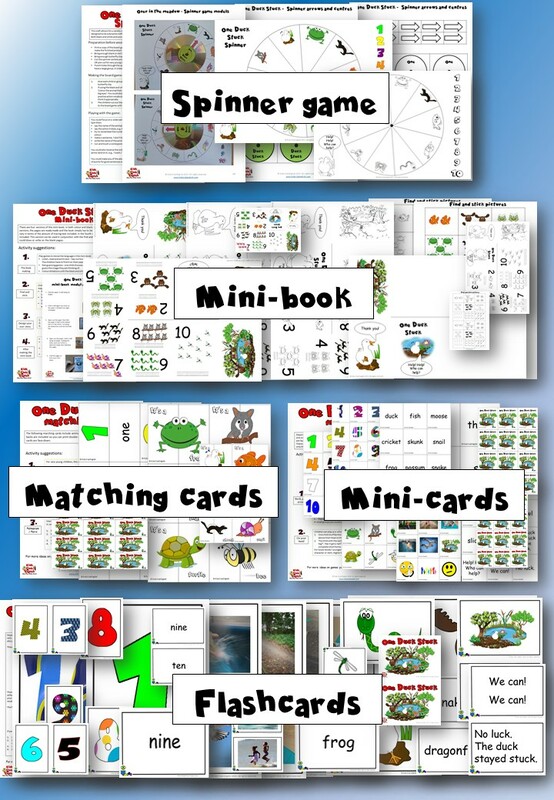 Matching Cards – Use these cards to play fun matching and memory games. Mini-cards – See the suggested games children can play while also developing word recognition and literacy skills. Flashcards – Use in a variety of ways to introduce and practice new language, develop literacy skills or as visual prompts for language games. The above images demonstrate what is provided in this pack. Download the preview for a closer look at the pack contents: Download Preview The entire pack contains 296 pages of information and resource templates! Please note the One Duck Stuck story is not provided with this resource but is available in major book stores. Visit the One Duck Stuck Story Resource Page for more One Duck Stuck Story videos, Songs & Crafts!